Thirteen years after leaving Bradley and just one month after winning the Hallgarten Prize, RSW returns to Peoria in 'spirit' by contributing 7 of his paintings at his alma mater. We have several pages that touch on the exhbition. The only piece of work we have a picture of, Out of the Mist (seen above) has a number of details. There is also an EXHIBITION PAGE you are welcome to visit, as well as, a featured article published in the Peoria Star on April 27, 1919, the closing day of the show. The "Southwick" house and studio of Robert Strong Woodward (1934 - 1957) was officially listed on the National Register of Historic Places on January 11, 2018. Welcome to RobertStrongWoodward.com! The website is divided into two main features. First is the Gallery of Woodward's artwork sorted in themes and then alphabetically. There is also the Scrapbook which contains collections of stories, memorabilia and specific citations related to Woodward, his life and achievements. It is at once a tribute and historical record of Woodward and the life and times from which he drew his inspiration. As a result of Woodward's handicap and thus limited mobility, his studios, by extension, provide a significant insight to the artist and his work. From his early paintings of the woods and brook behind Redgate, to the infamous wind blown beech tree atop Heath Pasture and his stunning window paintings from his Hiriam and Southwick studios you gain appreciation for the artist's work. The galleries consist nearly 800 known works of art created by Woodward. We have some form of an image for approximately 75% of them! The galleries are organized in two ways, first, is the Theme Gallery, sorted into 25 categories. The second is alphabetically, making up 8 separate galleries plus a gallery of artwork RSW didn't name or we do not have a name for at this time. Plus, visit our Complete Works List and surf the website from there! The Recollections Scrapbook is a collection of personal accounts from people who either knew Woodward personally or related to us an experience they have had related to Woodward. A number of the stories told come from this website's originator, Mark Purinton (seen in picture to the left with Woodward), who started working for Woodward as a boy. This is our "story behind the paintings" collection. It includes some of Woodward's favorite subjects, such as, his neighbor Harrison Keach's Farm, the Halifax (VT) House and the North Window of his Southwick studio. There is also Charlemont Bridge artwork before the bridge was destroyed in the hurriciance of 1938 and Marlboro Church, part of a "church series" Woodward was commissioned for by industrialist Francis P. Garvin before his death. The website has been busy digitalizing ALL the pictures in the estate scrapbooks. In that process we came across this old pic of the Griswold maple trees and sugar house seen in these works of art. The picture has been added to the pages. Digitalizing all the pictures in the estate's scrapbooks we discovered a picture of this painting better than the one we had and have now updated the page. The website has been busy digitalizing ALL the pictures in the estate scrapbooks. In that process we came across this old pic of Woodward in his Packard painting en plein aire this very piece. These pictures are some of the best samples we have of him working from the touring car. Also, he just so happen to note the pictures as , "Beecher's Pasture (Leyden)" and so we have changed the name of this Unnamed painting to reflect its location. Digitalizing all the pictures in the estate's scrapbooks we discovered a picture of this painting better than the one we had and have now updated the page. This image has been difficult to get a true representation of its appearance because all we have is the magazine cover on which it appeared and the colors used in print (particularly the yellow) is a bit over saturated, as well as, faded by time. We will continue to work to get it as close as we can. Digitalizing all the pictures in the estate's scrapbooks we discovered a picture of this painting better than the one we had and have now updated the page. This image stamped, "Oct 88", has been re-scanned and is better than the previous one. Unfortunately, the image is still not as high a quality as we would like. This painting once appeared on the original website and in the process of updating and redesigning the website... got lost in the shuffle. It is the ONLY painting we have come across in the 11 years of the new design to have been misplaced. Leaving no piece of work behind, it has now been added to the Unnamed Gallery where it belongs. It has been a tedious task but we are nearly finished with the NEW Sketchbook Gallery which will more than double the size of the gallery with over 70+ newly digitalized sketches! In what is our most ambitious effort yet, we have compiled every drawing we could locate and have now organized them into 4 catagories, (1) Drawings, (2) Sketches, (3) Ink and Print and (4) Designs & Plans - including all of the various ideas he toyed with for both the Southwick home & studio, as well as, the Heath Pasture Studio. NEW PAGES ON NORMAN KRASNA, RSW IN CALIFORNIA & MUCH MORE! This new illumination was recently discovered in papers related to Helen Ives and later given to RSW's cousin Florence by her sister-in-law Anna after Helen's death. Made for print, we believe while RSW was making his way as an illustrator, this piece is one which he also wrote the verse! RSW does not mention the publication this piece was published, nor the date. This signed painting by RSW came up for auction online January 28, 2019 and sold for $600. Victor is one of the friends who was most likely with RSW the day of his tragic gun accident. Fast friends through their mutual love of literature and philosophy during their brief year together at Bradley. 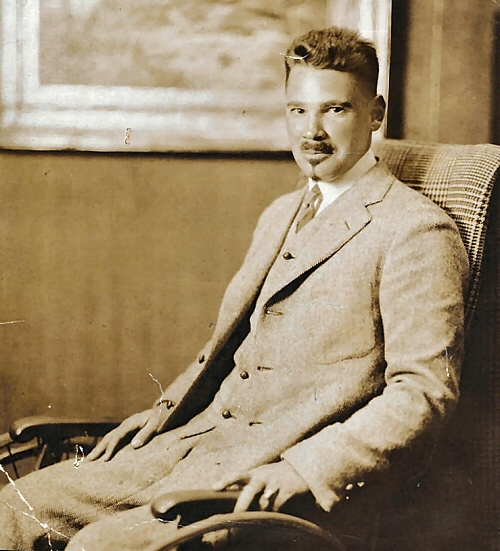 After graduating from the University of Chicago, Victor was in Los Angeles working for RSW's father as a secretary for the Briggs Realty Company. Victor went on to become the first head of the newly formed Political Science department at Stanford University. After revising the Boston Theme Gallery to reflect our most recent research we also sought to amend the scrapbook story regarding the Boston trip RSW made in 1930. A critical examination of the Boston paintings raised a number of questions as to exactly what was RSW's complicated relationship with Boston itself. We attempt to draw out the relationship's value as well as its flaws. Both essays reflect our effort to put RSW's career and legacy into context. ... The Boston theme gallery now reflects what we believe are the actually paintings painted from his stay in 1930 for the celebration of Boston's 300th birthday. Given the revisions to Boston Romance: The Oyster House and In Old Boston, Oil, we have also revised the original chalk drawing RSW made. He never names the drawing in his diary but we have settled on The Oyster House, Chalk for the time being. You learn something new everyday... We have always wondered why RSW would vary his spelling of the word grey/gray. For a time we thought his use of "gray" was a reference to color and that "grey" was more a mood. Well the discovery of this chalk drawing might change that theory or at the least put a kink in it. Auctioned by the Thomaston Place Auction Galleries, Thomaston, ME, on November 11, 2018. We learned that not only did we have the name wrong but the name we had this painting listed under is believed to be a previously unknown chalk drawing with a slightly varied name, Gray Heights! This previously unknonw chalk was brought to our attention by its current owner. It is of a solitary farm from a distant field with a backdrop of rolling hills and a big sky above. A closer look, which we provide, shows a woman leading a couple horse while laundry hangs to dry on the clothes line. A truly unique piece! This is embarassing to admit but for the longest time we took this bookplate to be for a Mr. Meredyth and a Mrs. Whitehouse when in reality this is the bookplate for prominant Chicago architect Francis Meredyth Whitehouse and his wife Mary Armour. The bookplate was for their Manchester by the Sea (MA) estate Crowhurst. We include new information and pictures! This wonderful unsigned and unnamed 36 x 42 painting, we believe, depicts a farmer leading his oxen pulling a buckboard carraige to collect sap late in the season, sometime around early spring. From its brush style, we believe it was painted sometime after 1935. It features a wide spreading maple, on a knoll, with 3 red buckets attached. In what appears to be painted in his early impressionistic impasto style, this piece illustrates an almost playful mirroring of clouds above with an orchard of apple trees in bloom below. It is interesting to consider if this really occurred and it inspired RSW to capture it or did he take some dramatic license and intentionally painted the clouds in a matching pattern? For a number of years now we have been trying to gather any information we can regarding the identity of Mrs. Herring. We have learned that more often than not, woman from prominant families often assumed their husband's name but kept thier own sans today's custom of using a hyphen. Eugenia Beetle is of the whaling industry's New Bedford Beetles. Visit the page for more...! In a rarity for chalk drawings we have had a high quality black and white picture of this piece for many years. Now we finally have a color picture sent to us by its current owner. It is of the unfinished silo, with the make-shift scaffolding that looks to be fragile at best, RSW painted several times from varying angles. After many years in California having once been owned by close friend, actress Beluah Bondi and her estate, this beautiful autumn painting has come home to New England! Recently cleaned and restored at the Williamstown (MA) Art Conservation Center and on exhibit until Oct. 31st at the PVMA... we may have the pictures but they do not compare to seeing it in person. GO SEE IT! Also recently cleaned and restored is this early composite painting of Clark Brook frozen in winter heading towards the Deerfiled River. Besides it being a rare composite painting, it also shows the subtle feature of a setting moon in the west. Also on exhibit until Oct. 31st at the PVMA... we may have the pictures but they do not compare to seeing it in person. GO SEE IT! Added to the complete works list is this previously unknonw painting cited by Mrs. Helen Patch in her letters to the Deerfield Academy's American Studies Group in June of 1970. We do not know if she got the name correct because there is already a 1921 painting by the same name but we will keep it in the catalogue until we learn otherwise. Previously unknown to us this painting comes to us from its current owner. It is one of those quintessential New England scenes that fits into multiple catagories... roadside, tree, autumn, rock walls and ledge, a fence, a wood pile, with just a glimpse into a distant field and hills beyond. A classic New England landscape, thus the name ascribed to it by us. This painting came up for auction and sold this July. We first learned of this painting 20 years ago when it went up for auction in New Hampshire but have never seen it in person until now. The only painting in RSW's catalog of its size, at nearly hundred years old it is in excellent condition! This wonderful tribute to RSW holds many interesting facts and tidbits, however, what is most impressive are the 6 paintings featured. Five of the paintings are the ONLY good quality images we have! What's more is to this day we do not know their whereabouts. It is remarkable for one article to contain so much value. We have also added a graphic to these pages illustrating the area. Our full scan of this article features the interior design of famous couple George Burns & Gracie Allen's home after close RSW friend Harold Grieve completed the work. Also featured in the article, hanging over the fireplace is RSW's Dooryard Elm which was purchased by the couple. Reason #2 why we do this... A man watches a movie on TMC, notices the producer's name and believes he knows relatives of said producer, goes to Google to look the producer up, and FINDS us! He writes us to tell us what he knows and may have solved a missing link regarding the provenance of a painting. It makes it ALL worthwhile! This previously unknown, signed and dated painting came to us by its current owner contacting us. It is one of RSW's earliest paintings as a professional, and he signed it "R Woodward 1918." We couldn't be more pleased to welcome it home! In one of our MORE remarkable discoveries, we recently have learned of RSW friend Helen Patch who when asked by the Deerfield Academy's 1969-70 American Studies Group to offer any recollections of Woodward. She related some gems as well as provided insightful assessments of the artist. A black-and-white of the original sepia taken by Ashworth was found at the Buckland Historical Society and far better than anything the website had, and so we made a copy to add to the website. On a visit by good friend F. Earl Williams in 1945, Williams brought along with him Kodachrome color film, which at the time was less than a decade old and took color pictures of his visit. Included in those pictures is a picture of this painting along side the subject of the painting, the east window. New information found on this painting's buyer, Dr. Amey Chappell a prominent physician, and recipient of the 1967 Elizabeth Blackwell Medal given by the American Medical Women's Association, its highest honor, qualifies her as though not "famous, famous" famous enough for us to recognize her! It started as a simple email inquiry from the historical society and led to the discovery of the location of where this chalk drawing was drawn, just off the Four Corners of Buckland where Ashfield, Hawley and Buckland all intersect. See our new graphics illustrating its perspective. Added to the Woodward catalog is this painting named in the "The Helen Patch Letters" by Mrs. Patch. The painting was also loaned to the Deerfield Academy's 1970 Hilson Gallery exhibition honoring RSW but inexplicably was left off their list. After all these years of trying we finally have an original image of this beautiful 'sugaring' painting. Up until now we had previously used scaned images of the painting taken from print material for which it was published. Wow, what a find! This wonderful painting of the Beech Tree in Heath is unnamed and unsigned. It is of the the tree in baring its fall foliage colors. It is in great condition. The image of this painting was discovered in a collection of KodaChome slides taken by RSW friend and amatuer photographer, Mr. F. Earl Williams himself and given to the Smithsonian Institute under his name as part of RSW's collection. We have had a pretty good picture of this painting for some time now but we always look to get the best possible picture of a painting and we succeeded with the lastest pic of this painting. Window Paintings are always difficult to photograph. Often the brown color of the wood paneling around the windows produces a glare that is hard to avoid, but we magange to in this new pic of this gorgeous painting. The image of this painting was discovered in a collection of KodaChome slides taken by RSW friend and amatuer photographer, Mr. F. Earl Williams. We could not match it to any known paintings and it appears unsigned as well. This has always been a difficult painting to photograph. RSW's use of light in the silk backdrop often produces an ambient glare when introduced to bright light needed to photograph... but we are getting closer to its natural look with this latest attempt. FINALLY! We have been hoping to get some color image of this painting, a fav of RSW's, for some time. 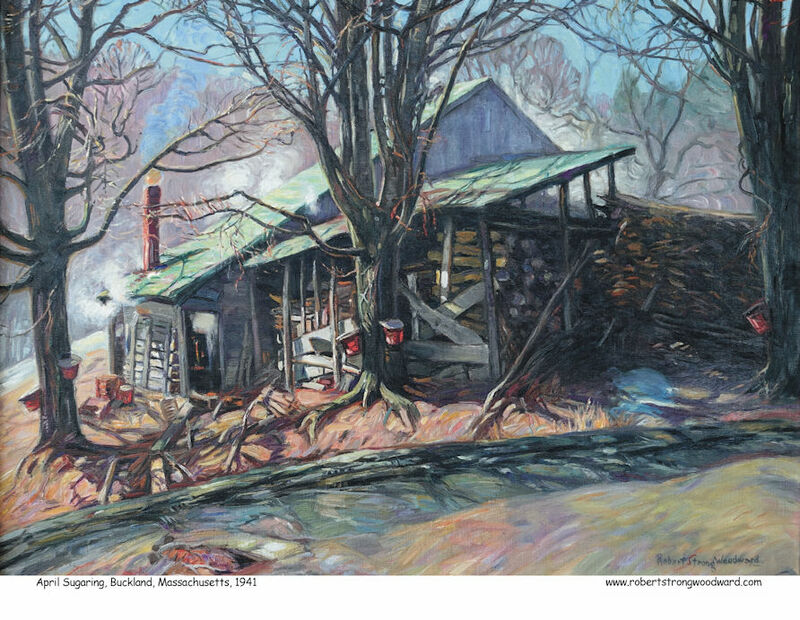 The image of this painting was discovered in a collection of KodaChome slides taken by RSW friend and amatuer photographer, Mr. F. Earl Williams. It is so difficult to capture how striking some of RSW's work can be. Nothing can substitute seeing it in person and this painting is one of them, but we will keep trying to get the best picture we can until it comes close. One of RSW's most unique pieces of work, drawn during his stay in Boston in 1930. Our new pictures of this drawing now includes close up pics of the people on the street and the window planters high above the scene. A truly spectacular work by Woodward. This illumination features a woman playing the cello by an open door and heraldic device containing poetry. Both the artwork and verse done by RSW early in his career as a commercial artist. One of two chalk drawings with the same name, this piece features a stream of autumn red running through a line of trees. It immediately reminds one of a Chinese Parade Dragon of which we believe RSW derived the name. This is an extraordinary find! Woodward was known to have an adversion to doing portraits because he did not feel confident enough to paint them to his satisfaction. To learn that he had done a self-portrait when he was 13 years old simply shocked us. A rare upright chalk drawing, this piece features a stunning sky above the Heath Pasture and Beech Tree in May. 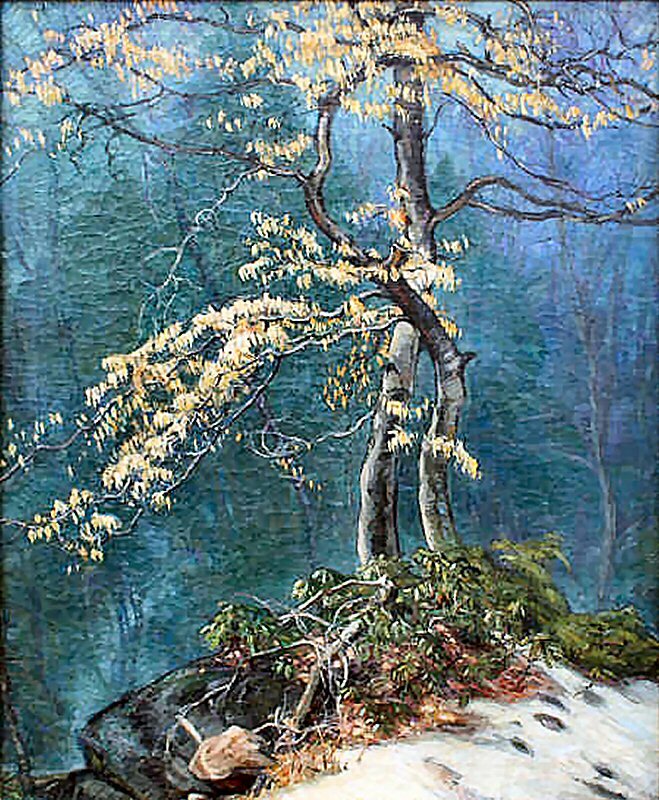 While May was a frequent subject of RSW's Beech Tree, this drawing is from an unusal perspective, not from the front of his studio but rather to the left of it.